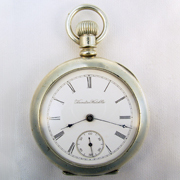 Fred Hansen's Vintage American Timepieces! Place this item on hold and request total price including shipping. Hamilton Watch Co. 18 size 7 jewel open face lever-set. The 7 jewel Hamilton is scarce with a total production of only 1000 made, all examples being found in the 2001 to 3000 serial range. This example has the usual gilt plate finish and its movement is in a much better state of preservation than most which are often found with a dulled or discolored gilt tone. Watch is fronted by its correct sunk-seconds enamel dial with script signature and is housed in a Dueber "Silverine" recase. Movement serial number is 2798. Running and a very nice looking movement with excellent gilt tone and just a few mild small spots and marks. Dial is excellent with just a very faint hairline below the seconds-bit at 26.5 minutes and some mild perimeter rub under the bezel. Hour and minute hands are mismatched. Case is decent looking overall and has a small dent at the bottom edge of its band causing a mild flat spot between the hinges. Inner back of case has a crudely scratched name and date. Good glass crystal.